You are currently browsing the The Pet Product Guru blog archives for the day Friday, August 2nd, 2013. 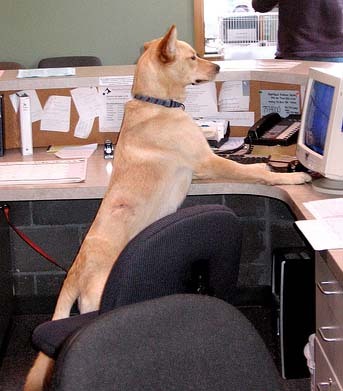 A researcher at Eastern Kentucky University did a study to see what people thought of pets in the workplace. She surveyed businesses that allowed dogs and cats in the office. She found that people who work with their pets believe that their pets help reduce stress and improve their mental health. Even people who didn’t bring their own pets were extremely positive about having pets in the workplace. They said that it made for a happier and more positive day. Of course kudos to those businesses that allow pets. They are a special breed in themselves and I believe that it says a lot about the company. Make sure that you take along plenty of treats for your dog and plan on taking him out for his regular walks while at work! Lindbergh Radio has changed. We now play an upbeat blend of Rock, pop, dance and alternative from the 60’s 70’s 80’s and 90’s. Give us a try! We’re on the EDGEWATER INTERNET RADIO NETWORK!